Beurre Maître d'Hôtel, also referred to as Maître d'Hôtel butter, is a type of compound butter (French: "Beurre composé") of French origin, prepared with butter, parsley, lemon juice, salt and pepper. 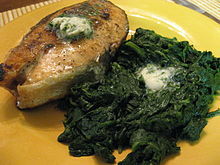 It is a savory butter that is used on meats such as steak (including the chateaubriand sauce for chateaubriand steak), fish, vegetables and other foods. It may be used in place of a sauce, and can significantly enhance a dish's flavor. Some variations with a sweet flavor exist. It is usually served cold as sliced disks on foods, and is sometimes served as a side condiment. The name of Beurre Maître d'Hôtel is derived from the manner in which it was commonly prepared from scratch by a restaurant's maître d'hôtel at diners' tables. [a] It is also referred to as Maître d'Hôtel butter. Beurre Maître d'Hôtel is a savory butter prepared by mixing softened butter with very finely minced parsley, lemon juice, salt and pepper. A ratio of around 1.5 tablespoons of parsley to two ounces of butter may be used. Additional ingredients may include shallot and Worcestershire sauce. Vinegar is sometimes used, although its inclusion is rare. Cayenne pepper has also been used. After mixing, it is typically rolled in parchment paper or plastic wrap and chilled to harden. Beurre Maître d'Hôtel is usually served cold as sliced disks atop various foods, and sometimes as a side condiment. It is used on grilled meats such as steak and fish, and also on eggs, vegetables, potatoes and breads. Some variations exist, including a few sweet versions that include sugar, which may be used on dishes such as pancakes. When used as a topping, it is typically added just before the dish is served. It has also been served melted atop dishes, whereby it is placed atop foods during the last few minutes of cooking. It may be used in the place of a sauce, and a small amount can significantly add to a dish's overall flavor. ^ "Most compound butters are savory. Perhaps the best known has the most daunting name, Beurre Maitre d’Hotel, so called because it was often made tableside by a restaurant’s maitre d’." ^ "Strain through muslin, and finish the sauce away from the fire with four oz. of butter Maître d'Hôtel, to which may be added a little chopped tarragon." ^ a b c Neman, Daniel (August 22, 2015). "Compounding makes butter better". Naples Daily News. Retrieved November 15, 2015. 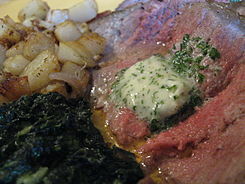 ^ a b c "Tasty Way To Butter Up Steak And Potatoes". Chicago Tribune. March 16, 1986. Retrieved November 15, 2015. ^ Virion, C. (1972). Charles Virion's French Country Cookbook. Hawthorn Books. p. 100. ^ Sinclair, C.G. (1998). International Dictionary of Food and Cooking. Fitzroy Dearborn. p. 60. ISBN 978-1-57958-057-5. ^ "How to Make Beurre Composé". The Wall Street Journal. September 20, 2013. Retrieved November 15, 2015. ^ David, E.; Child, J.; Renny, J. (1999). French Provincial Cooking. Penguin twentieth-century classics. Penguin Publishing Group. p. 133. ISBN 978-1-101-50123-8. ^ a b c d e f Leto, M.J.; Bode, W.K.H. (2006). The Larder Chef. Taylor & Francis. p. 92. ISBN 978-0-7506-6899-6. ^ a b Ruhlman, M.; Ruhlman, D.T. (2011). Ruhlman's Twenty: 20 Techniques, 200 Recipes, A Cook's Manifesto. Chronicle Books LLC. p. 133. ISBN 978-1-4521-1045-5. ^ Cracknell, H.L. ; Kaufmann, R.J. (1999). Practical Professional Cookery. Cengage Learning. p. 20. ISBN 978-1-86152-873-5. ^ a b Leslie Bilderback, CMB (2007). The Complete Idiot's Guide to Spices and Herbs. The Complete Idiot's Guide. DK Publishing. p. 165. ISBN 978-1-4406-2631-9. ^ Dusoulier, C.; Josserand, M. (2014). Edible French: Tasty Expressions and Cultural Bites. Penguin Publishing Group. p. pt46. ISBN 978-0-698-15735-4. Retrieved March 8, 2016. ^ Van Buren, S. (1890). Good-living: A Practical Cookery-book for Town and Country. Putnam. p. 252. ^ a b c Sinclair, C. (2009). Dictionary of Food: International Food and Cooking Terms from A to Z. Bloomsbury Publishing. p. 285. ISBN 978-1-4081-0218-3. ^ a b c Escoffier, A. (1941). The Escoffier Cook Book: A Guide to the Fine Art of Cookery. International Cookbook Series. Crown. p. 35. ISBN 978-0-517-50662-2. Wikimedia Commons has media related to Beurre Maître d'Hôtel. Mâitre d'Hôtel Butter. Bon Appétit. Beurre Maître D'. Serious Eats. This page was last edited on 14 February 2018, at 00:22 (UTC).